With a new name for 2019, DeForest Parks and Recreation presents Friday Flicks. 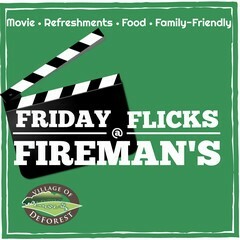 A different family feature will shown on the big screen at Fireman's Park on a Friday night during the months of June, July and August. There will be pre-movie entertainment and activities, along with food vendors and the concession stand to purchase from. We remind all movie goers to bring blankets, chairs, bug spray. The movie begins at dusk and admission is free.